One of the questions we often get is “When is the best time of year to see the wildlife on Caddo Lake?” The answer is right now. 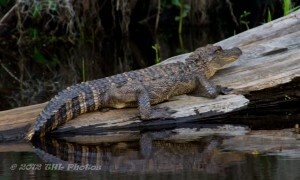 In fact both Spring and Fall are the best times of year to see the wildlife on Caddo Lake. When the nights are cool and the days are warm, the gators, turtles and other critters are pulling themselves out of the water to warm themselves. You can often see them laying on the beaches and felled trees sunning themselves. The handsome gentleman in the picture is a well known local named “Fraidy Cat”. The birds are changing out season right now as well. The Winter birds are flying north again and the Summer birds are just arriving. In early spring, many of the animals are waking up from their long winter naps and are hungry and frisky. It is a busy active time in the swamps of Caddo Lake!! If you are interested in getting up and close with nature, just give us a call at 903-655-9511. We can suggest several different types of tours on Caddo Lake. One is sure to be just the adventure you are seeking. This entry was posted on Wednesday, April 10th, 2013 at 1:08 pm and is filed under Caddo Lake, Jefferson Texas, state parks, The Carriage House Bed and Breakfast. You can follow any responses to this entry through the RSS 2.0 feed. You can leave a response, or trackback from your own site.